We at Car Body's R Us – Cash for Cars Beaudesert are a family owned and operated business since 1994; we service Brisbane North, South, East and West, as well as the Gold Coast and Sunshine coasts. 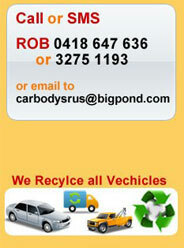 We remove CARS, TRUCKS, BUSES, 4 X 4's, VANS AND UTES. Get paid cash on the spot for your old car or car body, up to $500.00. Our free scrap car collection and car disposal service is available 7 days a week usually same day service in most cases. At Car Body's R Us – Cash for Cars Beaudesert, our focus is on delivering a high quality Cash for Cars service at a competitive price to all our customers in the Beaudesert area. If you are looking for friendly and reliable Cash for Cars provider at a more than reasonable price, give Car Body's R Us, Cash for Cars Beaudesert a call today!